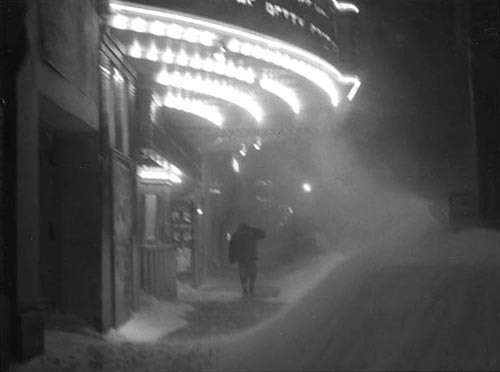 In honor of the recent snowstorm of December 11, 2010, the 12-11-10 Blizzard, which hit a good part of southern Minnesota, here’s an article I wrote in 1986, on the history of Minnesota’s blizzards and how they were viewed by the people who lived through them. The article makes the point that weather is one of the characteristics of Minnesota that has helped to create a regional culture in this place. My neighbor shovels snow like there is no tomorrow. This is the same guy who vacuums his lawn in the summer. When the first flakes begin to fall, he is out there with his broom and shovel, grooming the driveway. He continues his ministrations on an hourly basis throughout the storm. You have to hand it to him, though: When it stops snowing, he is finished shoveling, unlike the rest of us. I first became aware of his snow-shoveling habits several years ago, during the famed pre-Thanksgiving Day storm of 1983. That was the day I went out—while the snow was still coming down thick and fast—to shovel the sidewalk and locked myself out of the house. My neighbor was happy to lend me the screwdriver with which I tried to pry open a storm window. I smashed the thing when it wouldn’t give. I don’t know what it was that made me go outside that afternoon at the height of the first bad storm of the winter rather than waiting until it was over. Usually I let my wife shovel the walk. It may have been simple driveway envy. Most likely, though, it was for the same reason that my wife and I drove from Duluth to the Twin Cities during a blizzard a year later. I blame it on the Minnesota snow ethic. When a snowstorm is in full swing, you go outside. When faced with a blizzard, you drive into it. The Armistice Day blizzard of 1940 is imprinted deeply on the memory of recent generations. In many ways it was the classic Minnesota blizzard. It began on the morning of November 11 as a rainstorm. Without warning, the rain turned to snow. The temperature was 40 degrees early in the morning, but it dropped steadily, and by midnight it was near zero. The abrupt change in the weather caught many people outside without proper clothing or supplies. Many were trapped in cars on the highways. Scores of people, including 20 duck hunters, died in the storm. A history of the town of Clitherall recorded the story of a victim of an 1867 blizzard who set out from Alexandria for his home on a warm February morning. The first night he reached the town of Millerville. “The next morning the people he stayed with could see signs of a storm brewing and advised him to wait a day or two there, saying it would cost him nothing. But it was warm and he was so anxious to get home that not heeding their repeated warnings he left Millerville.” It was not until a thaw a few weeks later that his friends found his body in a snowdrift a few miles from his home. A number of accounts in William H. Hull’s remarkable compendium of reminiscences of the Armistice Day blizzard, All Hell Broke Loose, told of the rashness of Minnesotans in that famous storm. Al Kuehl was safe and sound at his cabin on Leech Lake. “It was snowing hard on Shingabee Bay but among the pine trees, the cozy cabin and fireplace, I was so comfortable I found the intensity of the storm hard to accept. Something told me to head for home, which was at Inver Grove, 15 miles south of the Twin Cities.” He got as far as Rice, where he spent two days in a railroad section house. Conrad Stai was teaching near Bemidji. School was let out because of the storm, and all the students were sent home around noon. Stai remembered: “After lunch I felt that a hike in a blizzard would be fun, something I hadn’t done in a long time. Blizzards were familiar to me since as a child I had walked or skied from school near Pinewood to our rural home. I had done this many times through adverse weather and had no fear.” After losing his way and staggering blindly along a country road, Stai found refuge at the home of some friends. Reactions to the storm varied. Most people who felt the brunt of it believed themselves lucky to have survived. Yet in spite of, or perhaps because of, the danger involved, many Armistice Day survivors expressed the attitude of one man who laughed with pleasure as he drove through the drifted Minneapolis streets proclaiming, “This is a great adventure!” His view was probably not shared by many poultry farmers. There is little enjoyment in losing your entire investment in Thanksgiving turkeys. What is it that makes people go out in a storm? And what makes blizzards the subject of such nostalgia? People don’t run after their hats in storms merely out of perversity. Often they set out in a storm because, as one Armistice Day survivor said, “Things didn’t seem too bad.” Or they have cattle to take care of or feel they just “have to get back home” if the weather is threatening. But I think people behave this way in blizzards and tell these stories simply because they share some beliefs about the weather. In these latitudes, the ability to withstand weather is a cultural marker, if not a cherished moral value. Ojibwe people living here in the 19th century survived during winter as much because of their attitude as their clothing. Missionary Joseph A. Gilfillan told of a poorly clad Ojibwa child who woke in the middle of a cold winter night in his family’s bark-walled home. “My little son, are you cold?” his mother asked him. “Yes, I am almost cold,” the child answered. Going out in the worst weather imaginable is an elemental adventure. It tests your ability to deal with adversity, which explains why many otherwise sane Minnesotans are compelled to go outdoors at the height of the storm. Even if they have no pressing need to go somewhere, they start their cars using every possible means and head out onto the snow-clogged streets and highways. Armed with sand, kitty litter, chains, shovels, jumper cables, starter fluid, and other devices and concoctions that might come in handy, they rock and gun their way through the drifts. In many ways, the experience of a blizzard is akin to what the pioneers went through when they settled in the wilderness, battling stumps, grasshoppers, drought, and nature in general. In other parts of the country, civilization may seem firmly established, but in Minnesota, the blizzards make you wonder if anything was ever really settled. It is up to those who decide to go for a spin when the wind is raging to re-establish civilization, as they escape from the mundane discontents of the very thing they are asserting. At the same time, blizzards create a sense of community in the survivors. People help each other in ways that decorum might otherwise prevent. My mother, who was not married until January 1,1941, recently confessed to me that my father spent the night of November 11, 1940, on the floor of her apartment with his back to the radiator rather than driving through the storm to his place on the other side of St. Paul. Many other blizzard survivors tell of people sharing beds, cars, streetcars, and snow caves with complete strangers. Even those who do not spend the blizzard together physically are united later by the memory of the storm. This weather-induced sense of community has helped transform Minnesota from a state marked off by an arbitrary set of political boundaries into a state of mind, a way of thinking and acting. Blizzards have contributed to turning Minnesotans, whatever their ancestral background, into a cohesive cultural group with shared values and interests. In the last few years Minnesotans may have drifted from their hearty traditions. No longer content to thaw out the turf at Met Stadium with flame throwers for the opening of baseball season or to watch football games during blizzards, Minnesotans now lounge about inside the Metrodome. To further fuel their flight from weather, they build skyways and shopping malls to insulate themselves from all that is invigorating. Will Minnesotans lose their ability to take everything the northwest winds can dish out? Will moral degradation follow? One promising sign is that no matter what Minnesotans do, the weather intrudes. Sure, they built the Dome. But then what happened? Along came a snowstorm to squash it. And what happened the night Walter Mondale was nominated for president? WCCO TV’s Dave Moore went on at 10 o’clock to say: “On a night when Minnesota’s native son is in San Francisco to be nominated for president, it is the weather which is the top story on the evening’s news.” That night it was tornadoes. The theater of seasons strikes again. On the other hand, if TV stations don’t make weather their top story, they hear about it. Former Minneapolis Star and Tribune TV critic Nick Coleman took WCCO to task for not making the September 24,1985, snowfall the lead story on that night’s news broadcast. He said WCCO was not as in tune with Minnesotans as the other stations. Clearly this is the function of news in Minnesota: to remind people what they may have forgotten —that we have rigorous weather here. This is why, almost every year during the first week of November, a small, faithful band of TV reporters and camera operators descends on the photograph collections of the Minnesota Historical Society. These newspeople are working on ritual stories on the Armistice Day blizzard of 1940. They come to view and film some of the most precious icons of Minnesota weather mythology: pictures taken by Minneapolis Star-Journal photographers showing automobiles lying in deep drifts of snow and frozen hunters stretched out in the underbrush near Red Wing. The stories might seem annoyingly repetitive to outsiders, but the Armistice Day blizzard may be the most important story TV stations do all year. No more telling reminder of what it really means to be a Minnesotan could be found. And it doesn’t hurt to warn people at the beginning of the winter that you never know what might happen. It may be warm today, but remember 1940? When you go out for a drive in the storm, be sure to put some extra blankets in the car. And canned goods, matches, flares, chocolate bars, jigs and line for ice fishing, and maybe some extra socks. And for God’s sake put a rope around your waist when you head out to the barn! What is it that makes a snowstorm bad? Sheer volume of snow? Size of drifts? Wind speed? For scientists, measures may suffice, but these criteria do not take into account the effects of storms on people. To determine the impact of a storm you must also consider when it arrives, what events it disrupts, and who it hits. Meteorologist Bruce Watson, for example, says the Great Blizzard of February 13 through 15,1866, “from the standpoint of combined cold, wind, and snow . . . can be considered the worst ever in the 19th and 20th centuries” until “the storm of the century” in 1975. But Watson also points out that the 1866 blizzard began at night when most people were in bed and hit hardest between Fort Ridgely and Big Stone Lake, a sparsely populated region. The state’s worst blizzards can’t be defined by mere statistics. A more reliable gauge is Minnesota’s local and county histories: Written by people who lived through many snowstorms, these books; provide the ultimate criterion—the authority of memory. Which snowstorms are most frequently remembered and recorded in these products of Minnesota’s collective consciousness? The following list is based on a statewide sampling of Minnesota county histories. 1871. January 7. The first blizzard experienced by large numbers of newly arrived Minnesota immigrants made a big impression. The three-day storm followed a period of above-freezing weather and many people were outdoors on their way to town when the storm hit- Many were trapped by its sudden arrival, and their bodies were not discovered until spring. 1888. January 12. In southwestern Minnesota this blizzard was ushered in by a drop in temperature from 18 degrees above zero to 25 below in one hour. The so-called Great Blizzard of 1888 occurred a few months later on March 11 in the northeastern states. Weather, like other things, seems to travel slowly from the Midwest. 1892. March 9. Two storms one from the northwest and the other from the south, combined to produce winds up to 58 miles per hour. The blizzard hit northeastern Minnesota particularly hard. Residents of Duluth claimed it was the worst snowstorm they had ever seen. It stopped all activity for three days and left hard-packed drifts as high as 10 feet in the streets. People who were trapped in their offices in downtown Duluth escaped from second-story windows after the storm. Ranks higher than all of its peers. 1923. February 11 This storm produced 40-mile-per-hour winds and a temperature of 20 below zero. A St. Paul newspaper reported winds that plucked cigars from people’s mouths and sent loose car bumpers blowing down the middle of the empty streets. A history of Douglas County calls it one of Minnesota’s severest blizzards. 1940. November 11 and 12. Like the storm of 1873, the Armistice Day blizzard became a watchword for a generation of Minnesotans. At the time of this storm, few were alive who remembered the 1873 storm, which perhaps explains its notoriety. The day had been nice, also the day before. That awful nightmare for everyone. And no sign of what was in store. 1965. March 17. Throughout the state, from Marshall to Duluth, snow accumulated at the rate of an inch an hour All told, the St. Patrick’s Day blizzard brought 10 to 15 inches of snow and drifts up to 25 feet high. One innovation, the snowmobile, allowed food and fuel to be brought to stranded storm victims. Because this article was written in 1986, an important storm, the Halloween Blizzard of 1991 is not included. And maybe now you should add the 12-11-10 Blizzard and a few other storms to this list. Thanks, Bruce! This explains why my husband went out Saturday afternoon in the middle of the storm to get a bigger goldfish tank. He didn’t get very far. Luckily, the sale was later extended.